Mark Markovich Warshavsky (Russian: Марк Маркович Варшавский; was born in Odessa 1848, died in Kiev, 1907) was a Yiddish-speaking folk poet and composer from the Russian Empire. In 1890,Warchawsky met with Sholem Aleichem when He was 42 years old. 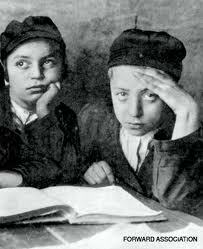 After listening to his songs, Sholom Aleichem was amazed. He said to him "Why do you not print such songs? If I would not know that you wrote and composed those songs, I would swear that I heard them from my mother!" In 1900, In Kiev Warshavsky, with Aleichem's full cooperation, published his first collection "Jewish People's songs". Mark Markovich included in this collection the best of his songs such as "Der Alef-Beis" and "A Brif fun Amerike". In these songs he described the Jewish life in the Russian Empire. How many tears lie in these letters?" As the poet is saying that the Jewish history has been built on tears.